Door canopies made from one of the best outdoor awning fabrics available which is Sunbrella. This top on the line awning canvas is most noted for its use on retractable patio awnings as well as window awnings and is now available for door canopies. This is the same fabric brand of outdoor fabric that is used on boat canvas, patio umbrellas and outdoor furniture. Valued for its good looks and resistance to weathering plus backed up by a five year warranty you would be hard pressed to find another awning canvas of this quality. Place this superior fabric on a no rust bronze framework carrying the same warranty and you have a D.I.Y. 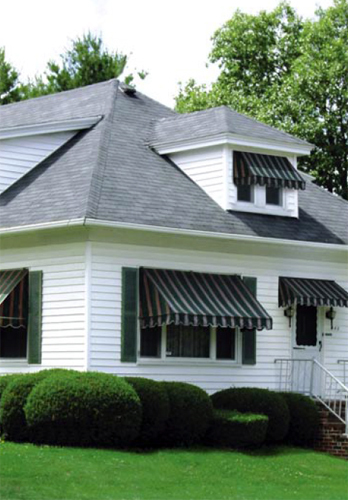 door canopy for nearly 50% less than the price of totally customized awnings. Custom made these high quality Sunbrella fabric door canopies can be sized from thirty-six inches wide out to one hundred and twenty inches wide in one inch increments which should easily cover most any size door or patio opening.